Jaaxy – The Best Keyword Tool Ever! Have you ever heard of Jaaxy? If not, then you are missing out. This is the best keyword tool ever and will make doing your keyword research a breeze from now on. You’ll want to know more before you jump right into the tool, right? Well, here’s everything you need to know to see why i believe this is the best keyword tool for SEO. Let’s start with a look at the tool. Just what is Jaaxy and what does it offer? To start with, Jaaxy is a keyword tool. It lists all keywords in a certain topic, with the ranking, the keyword power, and number of monthly searches. All the information is put together to help you choose the best keywords for your website, sharing an estimation of the number of visitors you’ll get from using the terms. This is more than just picking the lowest competition, highest searched for keywords. The tool goes deep into the details to help you make the absolutely best decisions for your own SEO needs. Everything you could possibly need is in one place with this tool. There’s no need to do further research to find out who is using the terms, what type of positioning they have, and whether you’ll be able to rank over them. Keeping it all in one place will save you time and effort, so you can actually work on your business. One of the things that makes this the best keyword tool ever is the ability to see who is using keywords. Most other tools will tell you how big the competition is, but not exactly who is using the specific words. You have to do your own research in this, which takes up far more time. With Jaaxy, you just get to see the web 2.0 sites and article directories that are ranking for the specific keywords. This is your chance to see how well the keywords do and don’t do, and whether it’s worth your time using them. You’ll be able to see where you need to use the keywords. For example, you’ll see if there are YouTube videos ranking for the specific phrases. If not, this could be the perfect way to get out there and rank well. You’ll hold the monopoly and have the longevity when your competition realizes the opportunities are there. It’s no good knowing who is on top without finding out how they are there. You want to learn as much as possible about the top 10 rankers in a certain term. Jaaxy quickly gives you these insights without spending hours working through the data. You’ll be able to see the number of words per page, the keyword density, the meta data information, and so much more. You’ll also be able to see just what type of site they are and how long they have been there. This information will give you an idea of how many words you’ll need to use in your content. You’ll get a better idea of ideal keyword density and how the keywords are used in the content. Mimic some of this data and you could see yourself getting on top of the search engine results extremely quickly. There’s also a search history. If you forget to save any of the details or are interested in how things have changed, then this is part of the best keyword tool for SEO to use. If you don’t know much about SEO yet, don’t worry about it! Jaaxy has you covered.There is full training available within the system. This training also updates as the search engine algorithms and suggestions change. You’ll always be on top of changes and ahead of the majority of your competition. The training isn’t just about improving your SEO efforts, either. There is training on affiliate programs—how to choose and use them! This is excellent for businesses looking into affiliate income and marketing. You won’t need to use the training if you don’t want. There are some videos on how to use Jaaxy, but the learning curve is minimal. With a day or two you’ll be an expert for your exact needs. When it comes to expanding your business, you’ll benefit from the best keyword tool ever. Jaaxy makes it possible to do your research into new niches. This is the chance to learn all about the different keyword suggestions, the websites using them, and how others have ranked. You’ll find out about the high targeted keywords with minimal competition, giving you an area to benefit from. Sure, you can do this with other keyword tools, but no other gives you all the information in one place. This is also a cost-effective way, so you can get started quickly instead of wasting your time in a niche that turns out to be overly saturated. It’s time to take your SEO to the next level. Jaaxy offers everything you could possibly need. If you’re not too certain, you can get 30 free searches when you sign up for a free account. Try it out and see what you think for yourself. 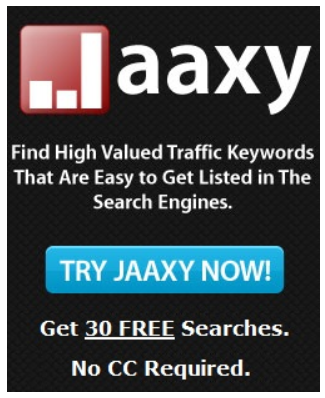 If you want to use the best keyword tool ever, you can sign up for Jaaxy for FREE today right here. I wouldn’t be without it.